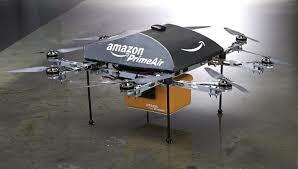 We have Amazon.com drones in our future. We all use Amazon’s delivery service for everything from rechargeable batteries to art books to beef jerky, and so I was quite taken aback when CEO Jeff Bezos showcased a drone delivery system called Prime Air on 60 Minutes. The idea is that packages below five pounds could be delivered straight from Amazon distribution centers to customers within 30 minutes using drones. As many have observed, it probably wasn’t a coincidence that the 60 Minutes segment aired on Sunday ahead of Cyber Monday, the busiest online shopping day of the year — a good time for Amazon to be in the news. Remember, Google has been experimenting with driverless cars, and is actually running a same-day delivery service in California, so it is definitely interested in human less logistics, for lack of a better term.